This is CNN, and I’m a talking head on what used to be the nation’s top 24-hour news channel. As you know from watching TV news, reading the paper, listening to radio, Twitter, TMZ, or just about any other media outlet, the Pope announced several weeks ago that he would be resigning. The papal duties proved too much for someone whose job it was to pray all the time. Now he’ll be able to do all those things he couldn’t do as Pope, like pray all the time. The Vatican told us he was resigning to spend more time with God, and we believed them. After all, it’s not our job to look deeper. Oh wait, it is. Instead, the Italian media uncovered the real reason behind the pontiff’s sudden departure—a brewing scandal involving gay priests, and more cover-up of the ongoing child sexual predator priests. Unlike us, the Pope foresaw the coming avalanche of investigations, arrests, public humiliation, and scrutiny that was about to be heaped upon the highest office of the Catholic Church. Call it “Papacy Death Storm 2013.” A great headline, but, like most weather-related superstorms, it turned out to be nothing. Nothing for us to cover, that is. Why should we sully the biggest story to hit the Church in nearly six centuries with a bunch of that nasty investigative journalism? Instead, how about a countdown to the new Pope? That sounds like so much more fun. So what if that makes us just as culpable for ignoring the abuse and scandal as the Church itself? The Church may have a reason for trying to cover up the whole ugly mess, but so do we. I think. So let’s not get all caught up in whether or not it’s CNN’s job to report, investigate, dig for information, and expose issues. Let’s run Headlines instead. Headlines are how this news organization gets respect. “Conclave to choose a new Pope expected to begin in five days,” then four, three , two, one, and finally, “The conclave has begun!” Wow. Heckuva job, Brownie (substitute name of whichever on-scene talking head has been in front of the Vatican for the last five days). Way to go, Scoop! Not that there weren’t some important facts unearthed during those five days. The Pope will not be wearing his red Prada slippers anymore, but he will be staying in the Vatican. And this just in: Pope Benedict XVI mugs are selling out in the gift shops to make room for the new Pope memorabilia. Nothing like reporting on Kennedy’s assassination by noting Jackie’s outfit, or Paul Revere’s famous ride to warn Americans that the British drink tea. CNN Alert! The ratings are coming! The ratings are coming! But I digress. Back to more Headlines. “Cardinals take oath of secrecy!” Isn’t that what got them into this mess in the first place? “Happening now: Doors to Sistine Chapel about to close,” followed shortly by, “Cardinals locked away in Sistine Chapel.” If only we could do this with Congress. 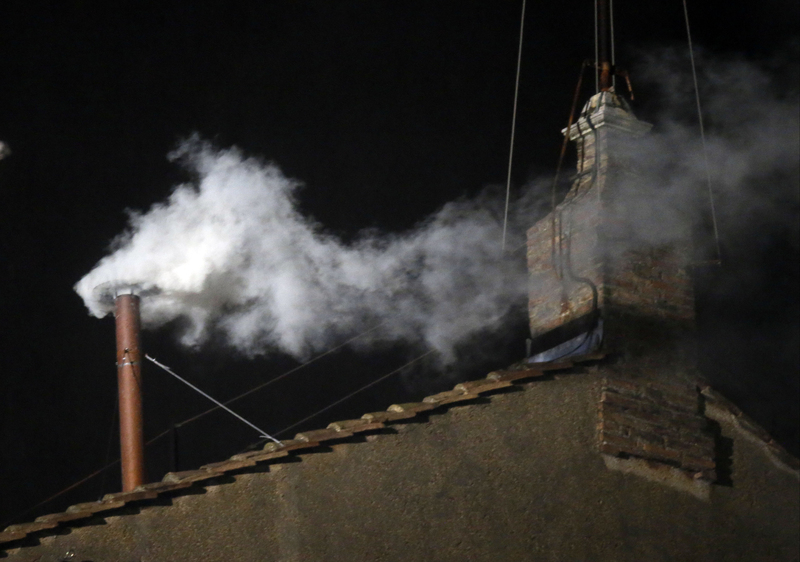 Then there was this, “Breaking News: Black smoke appears at Vatican—Means no new Pope chosen today.” Now that’s how you turn no news into breaking news. But there was more. “No Pope chosen on Day 1 of conclave.” Genius, pure genius. No headline, however, captured the essence of TV news like the following sequence: “The world waits for new Pope—115 cardinals take oath of secrecy,” followed immediately by “From pro soccer to priesthood—former player gives up the game for seminary.” And no one knows more about giving up the game than CNN. Ultimately, the smoke changed color, meaning a new Pope had been chosen. We were all over it (the color change). We had no clue who would be chosen. A man of the people, we were told, known more for eschewing the trappings of his predecessors, and for his work with the poor. And a little bit about that thing in Argentina for not standing up for some women who were about to be killed by the Pinochet regime. Yada, yada, yada. Blah, blah, blah. We did our job. OK, what’s next? Really? OK. Quick! Everyone! To Tel Aviv! The President is coming! The President is coming! This entry was posted in Mark Unger and tagged CNN, Media, Papal conclave, Pope, Satire. Bookmark the permalink.